Finished some of the snowflakes for one of my custom orders and will be working on and posting new items very soon. 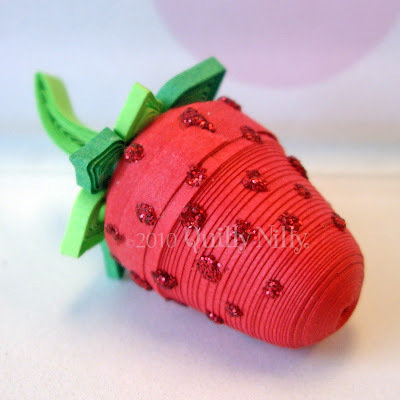 My daughter came up to my desk yesterday and I showed her this darling little paper 3D miniature strawberry I created and she said "where's the nuts? 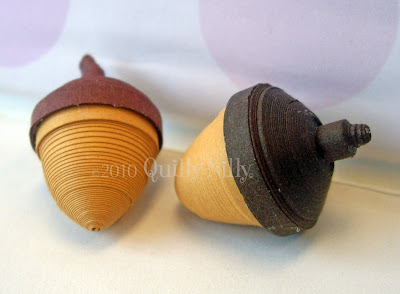 ", makes me laugh every time I think about it - she was talking about these cute little acorns I created the night before. I'm just having a blast making these little paper miniatures; I have some future plans for the acorns; still trying to figure out what I'm going to use the strawberries for - any ideas, feel free to share. 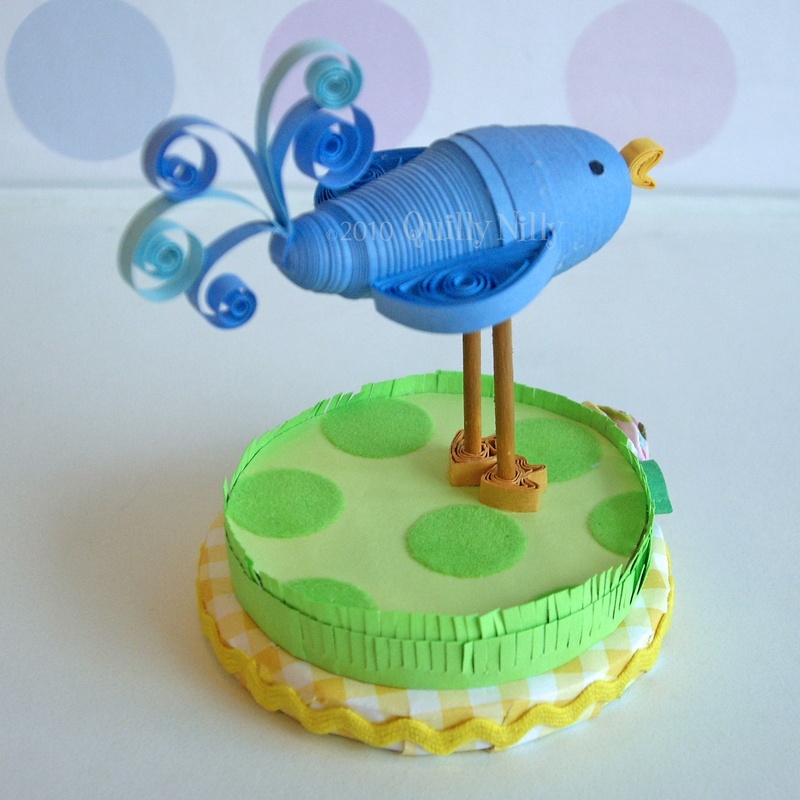 I'm also working on a 3D blue bird and will post that when he's completed as well. Have a great Monday! This weekend we are invited to two birthday parties, one on Saturday and one on Sunday. 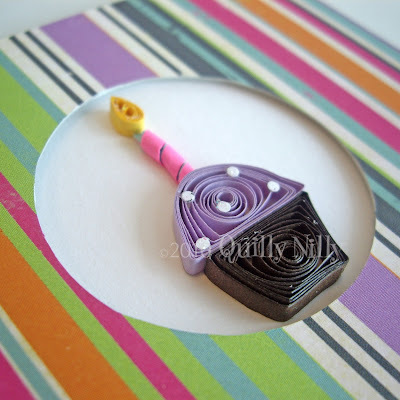 I rarely buy cards if it's a party for a little girl, instead I make them; quilling just lends itself to swirly pretty girly cards. Here is one of the cards created for a sweet little girl who is turning 5; I have tonight and tomorrow to make the other one but I'll be sure to post that one too. 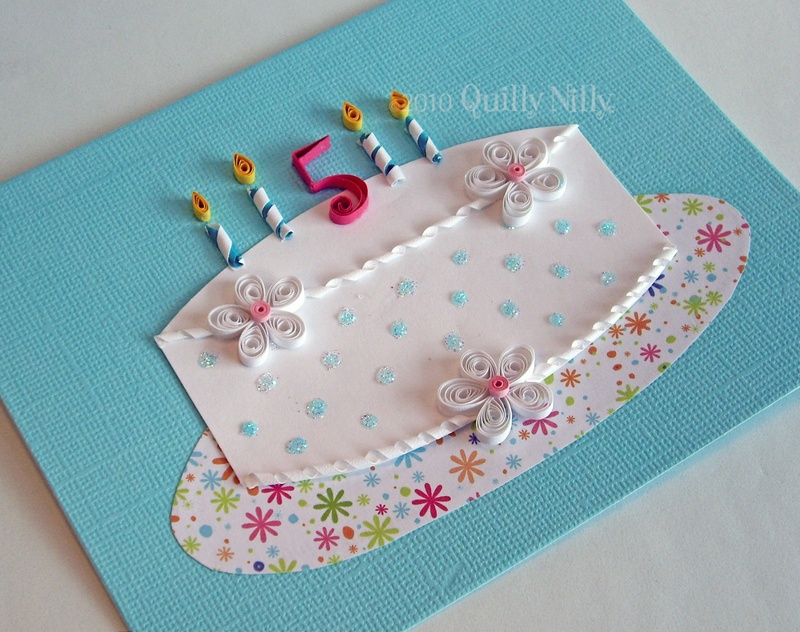 A card like this can be ordered through my etsy shop, just let me know if you have specific colors you'd like and what age needs to be put on the top. 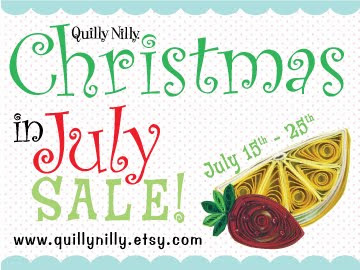 You're invited to my first ever Christmas in July SALE - I'm excited and I hope you are as well. I'm offering FREE SHIPPING to everyone, on almost all items (Clearance item excluded - although their shipping has been greatly reduced). 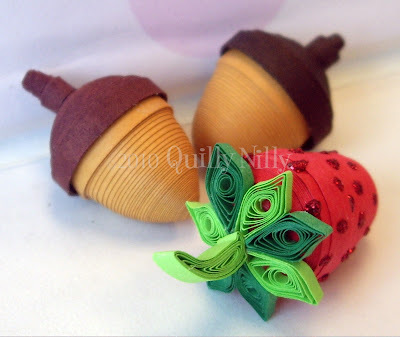 With each purchase a little goodie is always included and anyone who purchases something during the SALE will have their name put in a drawing for a Quilly Nilly birdhouse magnet - Woo Hoo, how exciting. 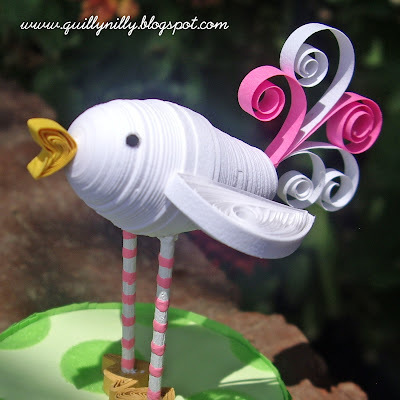 As a blog and/or facebook fan, I want to extend this offer to you a day earlier than everyone else. 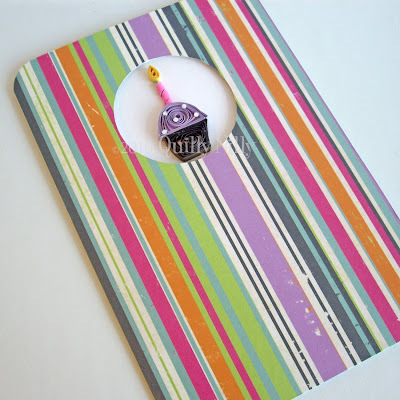 Please feel free to visit my shop, tonight or tomorrow; if you see something you'd like you can convo me through etsy and I'll revise the listing to show FREE SHIPPING and (I'll take an extra $1 off if purchased on Tuesday or Wednesday) and you'll also be entered into the drawing for the birdhouse magnet. I'll be adding items throughout the sale period so keep checking back if you don't see anything that catches your eye right now. Ok, so I didn't work on snowflakes last night; instead I decided to finish my miniature bird. 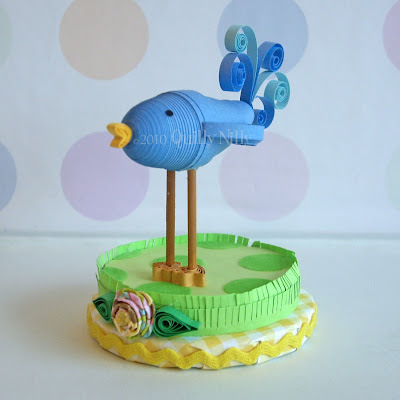 I have some new ideas swirling around, one is taking my quilled birds and translating them into 3-D; which I started and finished today. I like it, I definitely see area's on this that need improving before I start selling them in my shop; but for my first try I think it turned out cute. I want to know what you think about her, if you saw this in my shop would you purchase it - would it be for yourself or a gift. Is there anything you'd change about her? 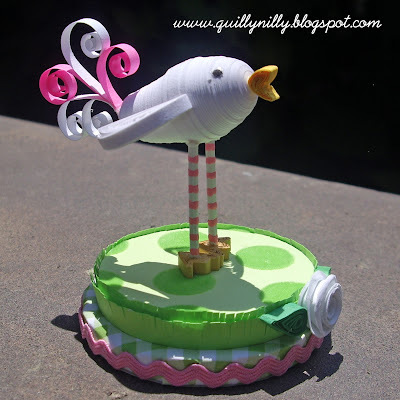 I want honest opinions, I can handle it - please let me know by leaving a comment; and have a wonderful weekend.